In my October Favorites, I mentioned how much I was loving my Goody TangleFix brush, so I get that it probably seems weird that I would pick this similar brush up so soon... but it made sense to me. I picked this brush up at Sally, where this Limited Edition version was on sale for $4.99, and at that price is seemed like it was a no brainer that it was worth a try. My hair has been a bit of a problem recently, dry and damaged and easily tangled, so a brush that fights tangles without breaking my hair is a must. And clearly, being the beauty junkie that I am, that means that I have to try multiple options to try and find the one that will be most gentle to my hair. 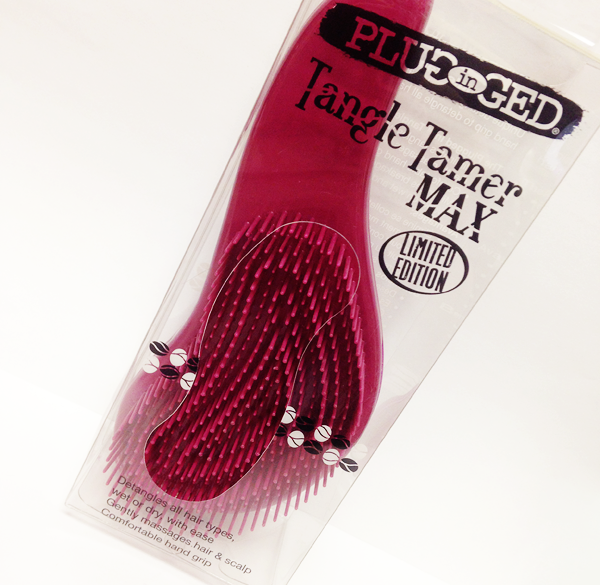 Keep reading for my thoughts..
A Plugged In Tangle Tamer detangles all hair types wet or dry! 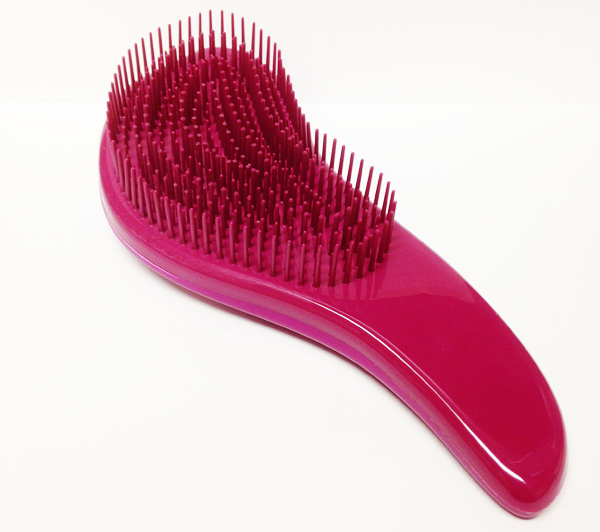 Specially designed bristles reduce tugging and breakage. A unique nonslip handle provide both comfort and control. In the past couple of years, there have definitely been a run of these kinds of brushes with bristles of varying lengths designed to allow you to brush and detangle your hair without breakage. 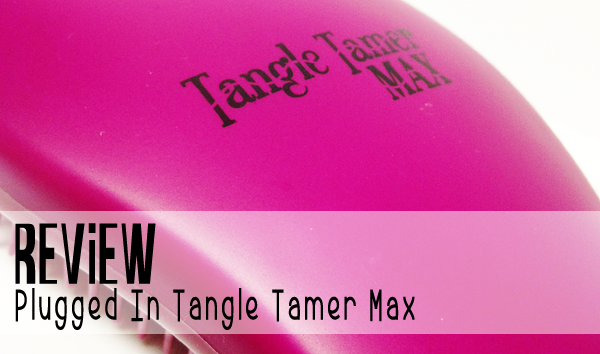 Thus far, I've only tried the two, but the most popular is certainly the Tangle Teezer. To be fair, I can't speak to the differences between these two brushes, but I will make a few observations. The thing that probably made me grab this brush was the fact that it had a handle and that still holds up as a huge plus for me. Neither the Tangle Teezers that I've seen or the Goody Tanglefix have a handle and I've actually found with my Tanglefix that the lack of handle is my biggest complaint. Maybe it's just because I have small hands, but I find it difficult to hold when I'm really working through my hair and a little less convenient to maneuver. On this brush, I definitely find the ergonomic handle easy to hold onto and maneuver around my head. On this score, this brush definitely wins. But does it work? Yes, it does. I've used this a few different ways and have had varying success. The first is obviously on wet hair, since that's where my biggest tangle issue lies. I find that this really does glide through the hair without any tugging or obvious breakage to sleek down my hair. The second way that I've used this brush is to brush out dry shampoo. This is a big one for me because I don't want to be able to see any residue in my hair after using a dry product. Again, I found this to be really successful in brushing out any trace of the product and giving my hair a clean, shiny look in the end. The third way I've tried this brush is with a blow dryer. Now, to be fair, I will say that clearly isn't what this is designed for, but in case anyone is hoping that this brush is going to be a catch all I have to tell you that it definitely isn't the easiest brush to blow dry with. In this circumstance, I find that even this handle isn't enough to give ease when working with it in that way. Finally, I've just used it to smooth out midday hair. Obviously, this too is a winner and gives my hair that soft, shiny look without any damage. My overall thoughts on this brush are YES! I really love it. Obviously I'm going to stick to my paddle brush for blow drying, because it's just easier, but for most other applications this brush really gets it done. I think I might pick up another just so that I can keep one on the vanity and one in my purse. This brush is available at Sally Beauty Supply and is currently on sale for $4.99!